My toe is fucked up. Luke and I went to the coast on Saturday afternoon. We had a wonderful day laying on the sand and dozing and feeling our way along the water's edge. At night we made a fire and roasted Safeway sausages for the fun and challenge of the activity more than the taste. We star watched and talked feverishly of space and all the potential above our heads (I've been reading Greg Bear's sci-fi trilogy Eon). It was late and we were both sleepy but we decided to roll a big log closer to our bed to make it even more cozy. And well, hell. 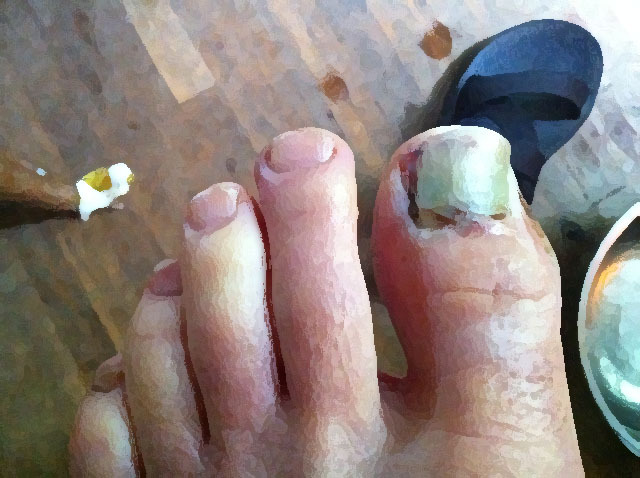 The log pivoted and crushed the top of my foot ripping the big toenail off. Off! All the way! I didn't even know this could happen and I went into shock and could barely handle myself. Luke drove us home in the middle of the night. He drew a bath and re-bandaged my toe while I averted my eyes and submerged my ears so that all I could hear was the tub. He made a bed on the floor so that I could sleep unencumbered. I was clean, at home, with a cared-for toe and Bello at my hip. I mourned the loss of my nail but I hailed the gift that is Luke.